Left to right: Our instructor Javier, Dominic, Carolina, Torban and, yes, me. A year in South America elevates your senses to what can only be described as ninja status. 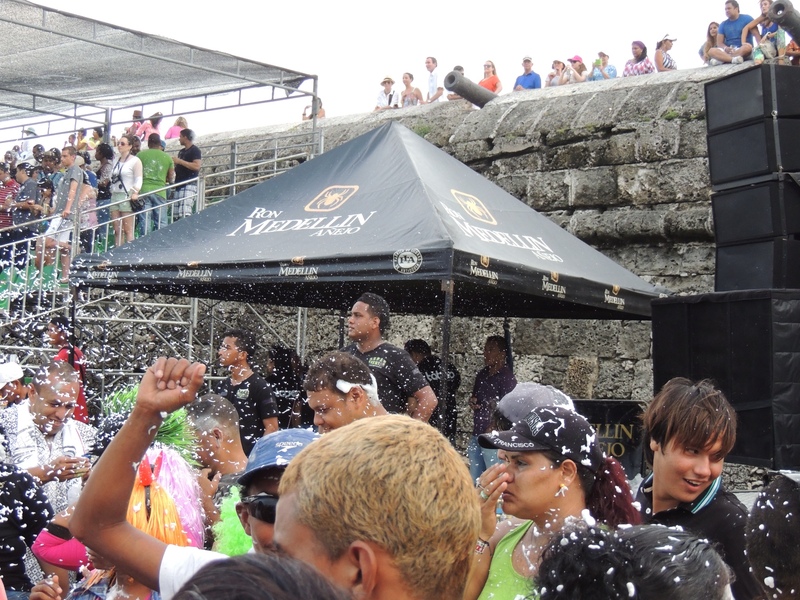 Especially after a week of Carnaval atmosphere in Cartagena, where the streets now lay littered with all of the evidence of a week-long party. Carrying all of the possessions that you own through dangerous streets, onto dangerous local buses and past surly Colombians is arguably one of the least enjoyable travel experiences – until of course you make it to your next hostel safely, when it becomes an adventure. I had a five-minute walk to the local bus stop, not entirely safe at 9am, followed by an equally risky hour-long local bus ride to the terminal. The first five minutes would turn out to the some of the most nerve-wracking of my trip so far. I spotted the guy following me almost straight away, it took me another 30 seconds to see his mate across the road. I paused to cross and he caught up to me, ‘How much money you got?’, I told him enough for a bus ticket (choosing not to explain the other $200US). ‘You need a bus ticket? You need to buy at my office across the street. Come with me.’ Uh, no thanks. I crossed the road and his friend started part two of the scam, ‘Buy a bus ticket in my office’ he encouraged me. I knew that the only place you bought tickets was on the bus, not in their non-existent office around the corner. I ignored him and walked to the nearest bus to check if it was going to the terminal, I reached the door as middle aged woman screamed ‘GET ON THE BUS, NOW!’. It was then, sighting the flash of silver behind me, that I jumped on the bus as it rocketed off down the street, literally centimetres from being slashed for my pack. After just over an hour of being told off by the nice Colombian woman for walking around alone, I wandered into Cartagena’s main terminal. I had a four hour bus journey ahead of me to Santa Marta, and then planned to go a further 20 minutes along the coast to the smaller coastal town of Taganga. After the morning’s excitement, things seemed pretty relaxed as I went through the motions of a normal four hour South American bus journey: delays, transfers, stops and shouting; nothing that I’m now not totally accustomed to. Why aren’t you here? Taganga, Colombia. So, finally, Taganga. I’d heard just enough about this fishing town to know that this is where I wanted to stay. Although it has boomed in the last few years (and sprung up the nightclubs to match) it is still a great deal less stressful than the nearby Santa Marta. My Isreali buddy Omri had recommended Casa de Felipe as the place to stay, so I made the 10 minute walk up from the beach to the relaxed hilltop hostel. I’d been planning to dive in Colombia for the past few months and, with a stroke of luck, the following morning I didn’t have to look far for other people with the same ideas. Enter Torban and Dominic, representing Germany and Switzerland (in that order) and possibly one of the funniest pairings I have met on my entire travels. Later to become Torrrbbyyy, Torban had all of the features of a typical German: scary when angry, generally frustrated, and keen to find a bargain. The only feature he didn’t exhibit was organisation, managing to extend cold showers past twenty minutes – even if our plan was to go to the beach for a swim. Dominic spent most of the first few days not understanding a word I was saying, referring back to Torby for translation and generally just repeating what I said back to me (Hey maaaannnn!). We competed for the title of ladie’s man, but I think its safe to say I was comfortably defeated in this department. 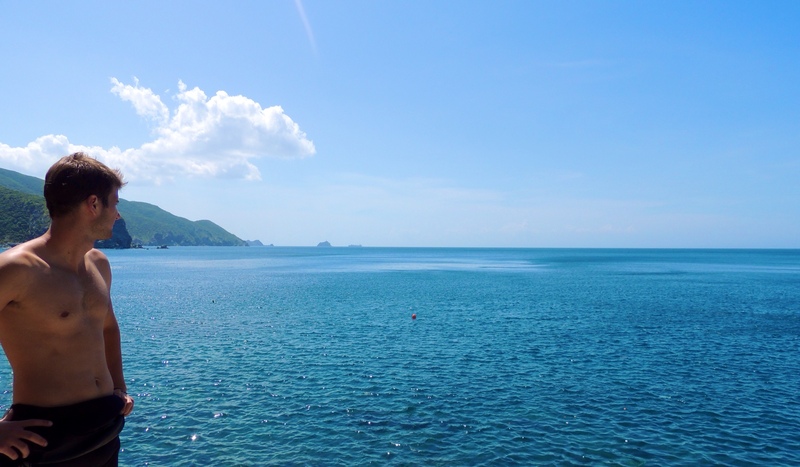 So the first day in Taganga was planned: bargain hunting for three days of scuba diving around pristine coral reefs in warm Caribbean waters and our Open Water Diving Licence. The first diving centre we visited was run by an expat Bavarian who was painfully honest: “Yes, we are the most expensive in town. But we are also the best. You know why we are the best? Because we are German. And we have the biggest boat.” Torban loved him immediately, but we weren’t convinced. Soldiering on through another three dive centres, we had mixed reports and were starting to tire of the same pitches over and over. 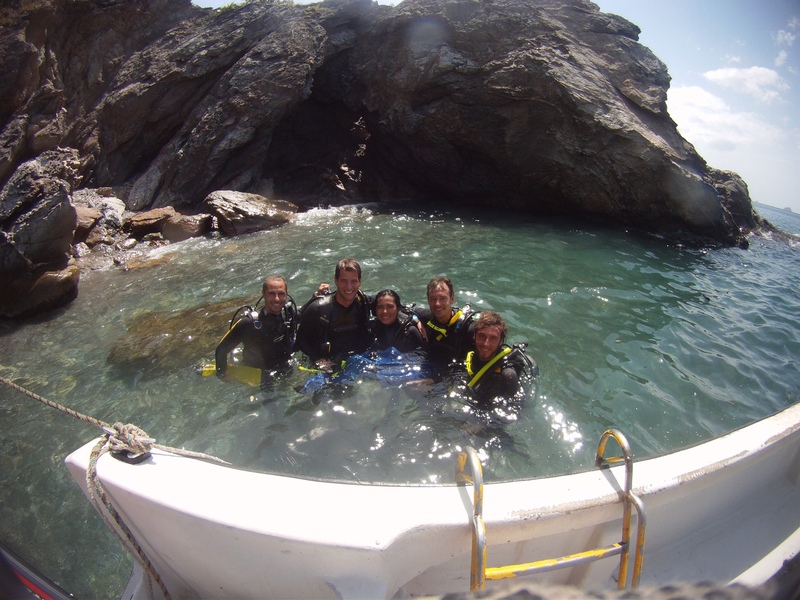 Oceano dive centre were our choice in Taganga, and it turned out to be a great one! 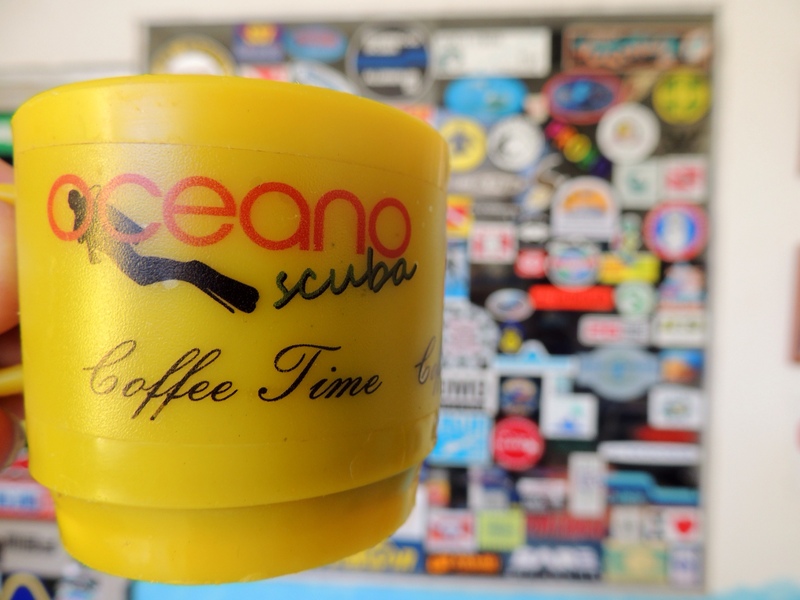 Our last stop was Oceano dive centre, a professional looking outfit with friendly staff. After some of the best (and longest) haggling of our lives, we were happy with everything – equipment, staff, service, cost and dive locations. These guys are my top recommendation, you can find them here. With beers on the beach that evening to celebrate, we could finally relax with our next three days totally organised for us. Two dives per day, beginning with the training video and lots of free coffee and biscuits. Three days of boat tripping, sunshine, wind in our hair and tanks full of air to look forward to. Torban could barely wipe the smile off his face, kind of like a three-year-old who has just been given a Kinder Surprise trapped in a 28 year-old’s body. Dominic and Torban with our gear on the private beach. We went through the usual routine with our equipment and loaded it onto the boat before setting off from the beach around the northern tip of the coastline and coming to rest at a private beach. We got straight into it, gearing up and wading into the water to begin the basics. We even had time to set off for a shallow dive just beyond the beach, before surfacing for lunch and getting back into it for the afternoon. It was on this first day on the beach that I was introduced to the scariest ‘jumping cliffs’ I have ever seen in my life. These are basically cliffs which stupid people jump off to make themselves look cool. I wanted to look cool but it would take me three days to work up the stupidity to throw myself off the mammoth 12-metre high beast and crack a rib five seconds later when I hit the water. 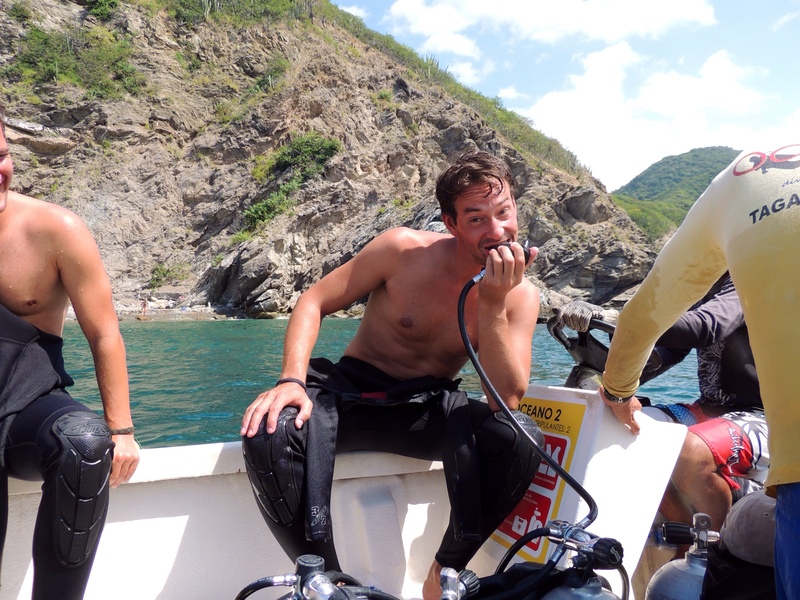 On our second day on the boat the Colombians stirred with excitement before the afternoon dive. Later, our guide Javier explained that a suspected drug boat had been sunk close to a dive spot and we might be able to take a look at the wreck if we wanted to. Thrilled by the prospect of a wreck dive, it didn’t take us long to make up our minds. The boat had lodged on the ocean floor pretty close to our limit of 18m depth, and this would be the deepest we had descended so far. We followed the rope from the anchor deep into the unknown, murky depths and it was the first time I felt panic rise in my chest. After a short break, we descended further and the shape of the sunken boat rose out of the dark blue depths. An absence of coral on this part of the ocean bed meant that the only activity came from us divers and a smattering of curious fish. Posing for the GoPro, we swam around the wreck for 20 minutes gazing into the interior and swimming through the upper deck. 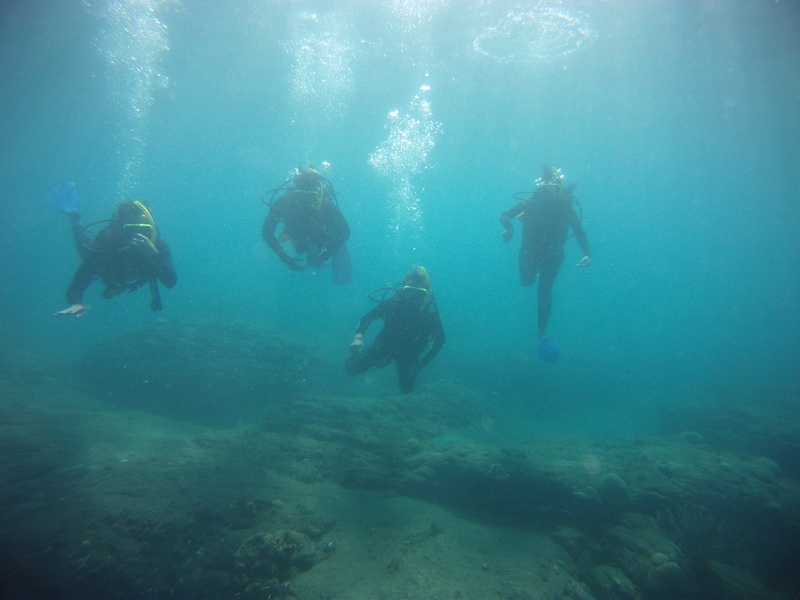 Our small group just below the surface at the beginning of a deep dive. Scuba diving is unbelievably frustrating when it comes to showing your emotions. Obviously, talking is out and if you smile you get a mouthful of saltwater. Getting anybody’s attention consists of waving and tapping and even then, once you have them it’s not very often they know what you’re talking about. For me, not talking for 40 minutes at a time was incredibly difficult, instead I was forced to resort to underwater dancing. Day three rolled around and by now our tight knit group was super excited for our last couple of dives, our Open Water Diver accreditation and some celebratory beers afterwards. 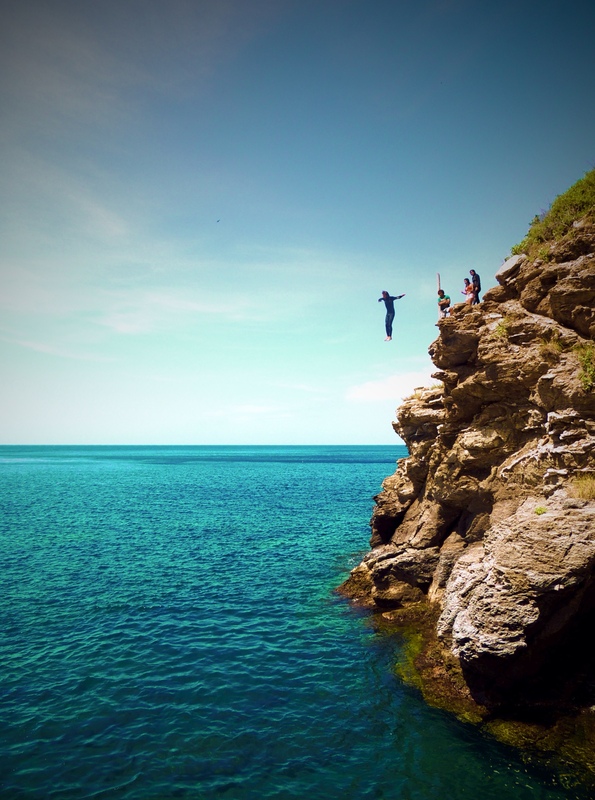 Unfortunately, one thing stood between me and my last dive: jumping off the crazy high rocks. For the first time in three days, there seemed to be about a million other people diving and our audience had been boosted beyond thousands. The steep, sharp slippery climb up to the rock face didn’t do much to calm my nerves but after five minutes of my brain screaming no, I made the leap. All I can remember is the sound of the wind in my ears and the crack of water on my feet. I earned the photo, a big thanks to Mark, a cracking Aussie photographer who made the shot. I wouldn’t have wanted to do it again! With the diving course finished, new friends made, we turned our attention to making the most of what Taganga has to offer: beaches, hammocks, coconuts, cold beer, pizza and beachfront bars entertaining gringos and locals late into the night. As Torban and Dominic went their separate ways and Carolina returned to Bogotá, I settled in to the relaxed town atmosphere and spent another week soaking up sun and having fun, meeting plenty of great people along the way. Watch out for the next photo post from Costeño, a short overnight trip along the Colombian coastline. As always, the photos tell the other half of the story. Enjoy the galleries attached to the post.